Are you heading to OBX for your next beach vacay? Skip the expensive, crowded hotels and opt for a luxurious vacation home like one of these Outer Banks Airbnb rentals instead. Just off the coast of North Carolina, there are so many things to do on the Outer Banks! That’s why “OBX” is a beloved destination for families who return to its beautiful beaches year after year for sunshine and friendly vibes. If you’re wondering about the best place to stay in the Outer Banks, we suggest looking for OBX Airbnbs in Corolla, Cape Hatteras, or the Northern Beaches like Duck, Nags Head, or Kitty Hawk. Fans of Nicholas Sparks may also love spending a few Nights in Rodanthe, where you can visit scenes from the popular book and film. Whether you’re after family fun in the sun or a romantic, oceanfront getaway, choosing the right Outer Banks vacation home is key. That’s why we’ve selected the best Outer Banks Airbnb rentals for your below! 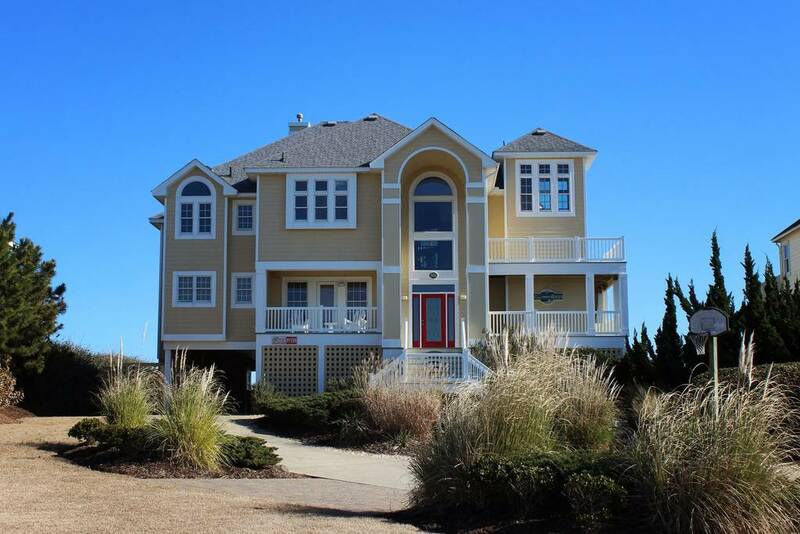 Family fun in the sun is easy at this huge, oceanfront mansion vacation home in Corolla, NC. This stunning beach house resembles an enormous castle with round, tower-like rooms and large wrap-around balconies. Clocking in at a stunning 5,300 sq.ft. 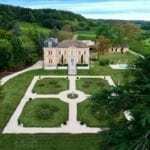 this home can easily accommodate multiple families or 16+ guests with six large bedrooms, 10 beds in total, and six bathrooms. Located on Buck Island in Corolla OBX, this upscale mansion is ideally located for a fun-filled family getaway. Relax and unwind at home in your own oceanfront swimming pool with hot tub, or take a quick stroll down the shared beach walkway to feel the sand between your toes. Inside are numerous attractive amenities for entertaining and socializing together as a group, from a rec room with game table to the main living room with huge flat screen TV. All this is available to book for around $650 a night. Feel right at home when you step inside this inviting, oceanfront estate in Corolla, Outer Banks. 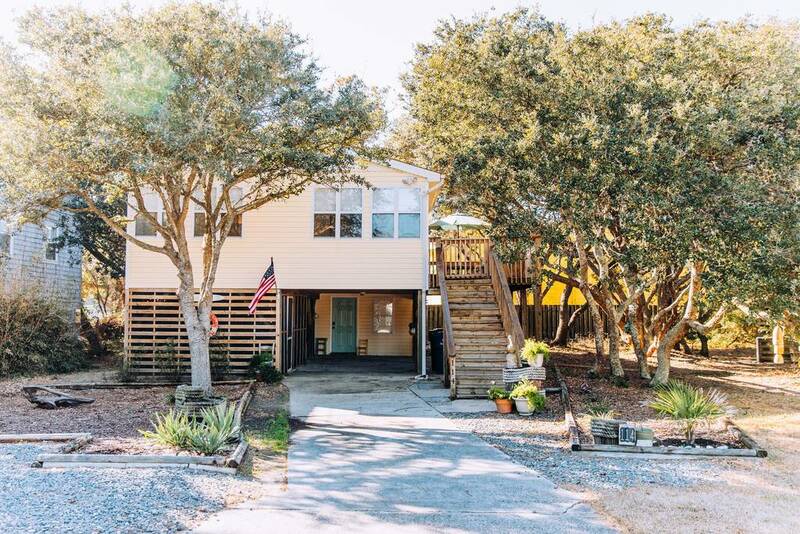 For a large group of 16+ guests, this could be the best Outer Banks Airbnb rental for your beach vacation! This heavenly property boasts direct beach access via a private, raised walkway over the dunes, in addition to an enormous private swimming pool and hot tub. 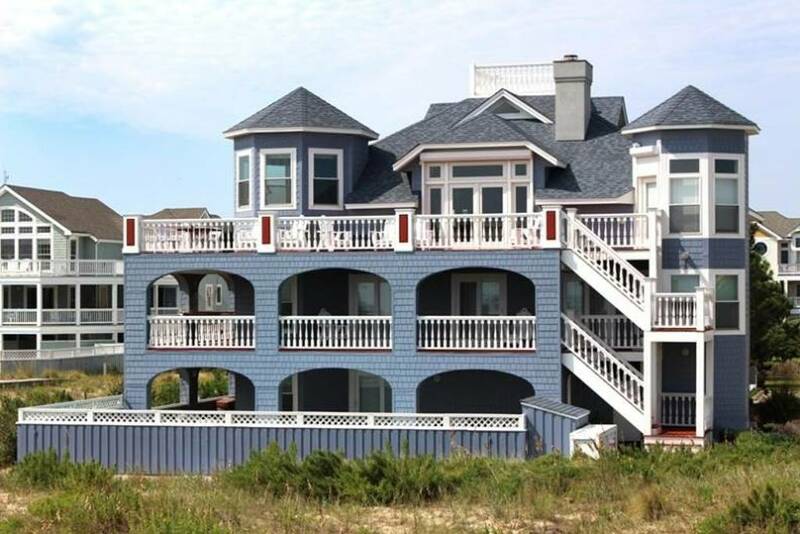 Available from around $890 a night, this luxurious OBX vacation home has six large bedrooms with 10 beds in total and 5.5 bathrooms. Enjoy stunning beach and ocean views from nearly every room, particularly the sprawling open-concept main floor living space. With an additional recreation room fitted with foosball table and flat screen TV, there’s plenty of space for the kids or teenagers to hang out apart from the adults. Everyone can come together over a family meal in the large dining area, which opens out onto a covered lanai with gorgeous ocean views. There’s plenty to do in Corolla and throughout the Outer Banks, but you may never want to leave! Stay in one of the most exclusive residential areas on the Outer Banks at this private oceanfront vacation home in Duck, North Carolina. This luxury Outer Banks Airbnb is tucked away in Palmers Island, a very private enclave of around a dozen oceanfront estates. There are no backyard neighbors here! From every room, enjoy unobstructed views of the Atlantic Ocean or peaceful Currituck Sound. Take a short stroll down to your private deck right in the sand dunes to listen to the waves crashing nearby. 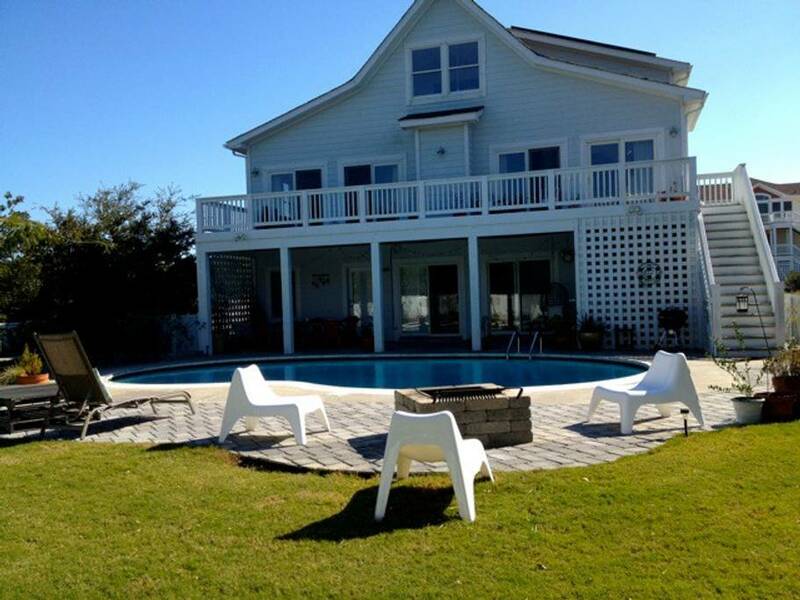 Available from as low as $740 a night, this incredible vacation home in OBX can accommodate 14 guests with ease. There are six large bedrooms with 10 beds in total, plus 6 full bathrooms. The home is ideally arranged for a group of friends or multiple families seeking a luxury beach vacation together. Enormous rooms, an open-concept floor plan, and ample deck space outdoors mean there’s no shortage of areas to entertain or relax together. As a bonus, guests enjoy privileges at the nearby Sanderling Swing & Racquet Club or can reach the pristine golf courses of Currituck Club in minutes. For something a bit less shabby-chic, we love the sleek styling of this modern beach house in Kitty Hawk, Outer Banks. The two main bedrooms are styled like an industrial-boho loft, both with a private bathroom, while there’s also a darling kids room located just off the kitchen. This vacation home can accommodate up to 5 guests, great for a family with a young child or two couples sharing. Available from around $300 a night, this luxurious OBX vacation rental is just a half-mile to the beach in popular Kitty Hawk. Coffee shops, boutiques, cafes, and even spas are within walking distance, as are numerous biking paths. This stylish family home is one of the most unique Outer Banks Airbnb rentals we’ve seen, ideal for design-conscious vacationers looking for a beach house that’s also a bit more modern and upscale. This light, breezy, beachside vacation home in Nags Head OBX is filled with natural light and coastal vibes. Also available for shorter summer stays, this could be the Outer Banks Airbnb getaway you’ve been dreaming off! Located in delightful Nags Head, this vacation rental is on a quiet cul de sac walking distance to Bonnett Street Beach, Dowdy Park, and The Spot Ice Cream. Available from around $350 a night, this OBX Airbnb can accommodate up to 7 guests with three bright bedrooms (including kids’ room with double bunk bed) and two full bathrooms. Start your morning with a leisurely stroll along the beach or have a coffee in the light-filled sunroom, just off the newly remodeled kitchen. There’s even a cool, cozy, screened-in porch downstairs, perfect for chilling out with a cold beer or margarita in the shade. Picture yourself, cocktail in hand, gently swaying in the breeze while resting in a hammock overlooking the water… sounds good, right? When you book this spectacular waterfront Outer Banks Airbnb, this and much more could be all yours. Available from $475 a night, this huge family vacation home in Avon, NC can accommodate 16+ guests with ease. There are eight bedrooms with 11 beds in total, plus six large bathrooms, creating the ultimate OBX getaway for friends or family. 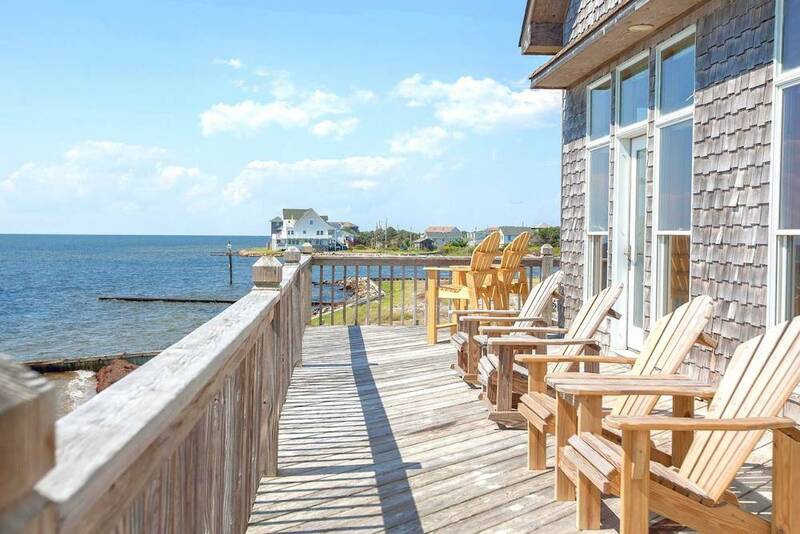 Located right on the water in beautiful Avon, this gorgeous home boasts million-dollar views of peace Pamlico Sound and one of very few heated swimming pools on the island. Enjoy staying close to the marina and nearby fishing village, the perfect location for a restful group getaway in the Outer Banks. This brand new beach house in Buxton on the Outer Banks is an outstanding choice if you wish to stay closer to Cape Hatteras and its famous lighthouse. Located just 300’ from the island’s best swimming, surfing, fishing, and sunning, this beautiful beach house is available from around $330 a night. No detail was overlooked during the building or design process, ensuring a bright, open floor plan ideal for entertaining as a group. Accommodating up to 8 guests is a breeze with four bright bedrooms and three full bathrooms. There is ample space to spread out and enjoy a bit of privacy from the rest of the group, but it’s just as easy to come together for quality time as well. Buxton is a fantastic place to stay on the Outer Banks, located moments from Cape Hatteras Lighthouse and National Park areas. These are some of the best beaches in OBX, ideal for your next family getaway. 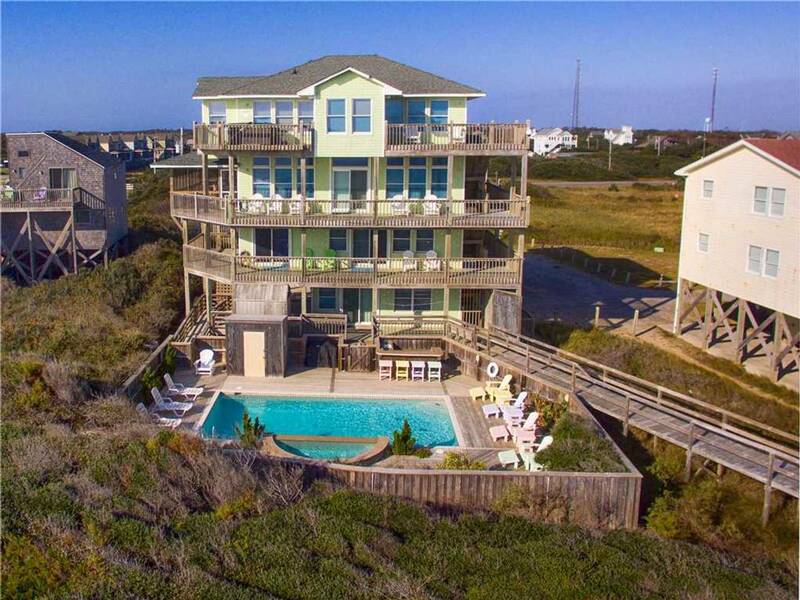 Located just minutes from the Cape Hatteras Lighthouse, this beautiful Outer Banks beach house vacation rental has everything you need for a memorable getaway! Smartly designed, the spacious floor plan is spread out over four floors, with space to accommodate up to 14 guests with ease. There are five big, master-style bedrooms and five bathrooms in total, plus an additional futon and sofa bed. 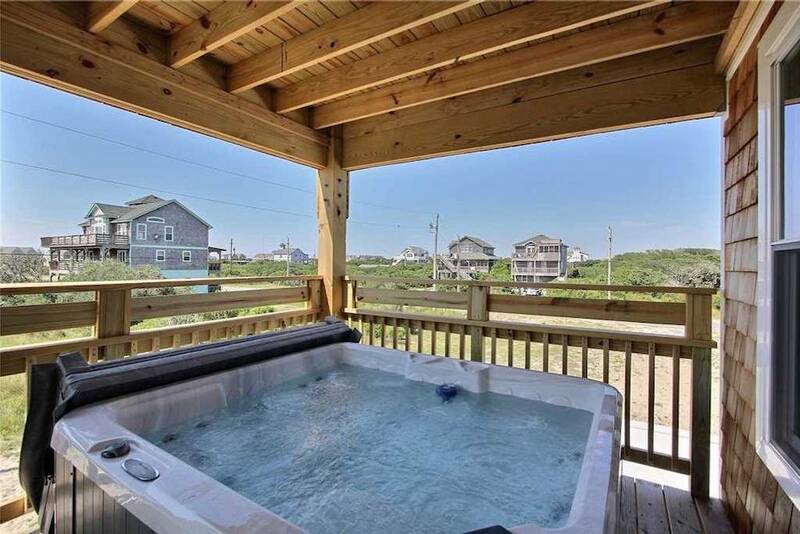 Available from around $400 a night, this spectacular Outer Banks Airbnb rental comes equipped with a fantastic swimming pool and jacuzzi tub, private walkway access to the beach, a huge game room, and a separate media room. Family members can easily enjoy downtime in peace or else come together to entertain and socialize as a group. With so much space and many luxurious amenities, your family may never want to leave the Outer Banks!